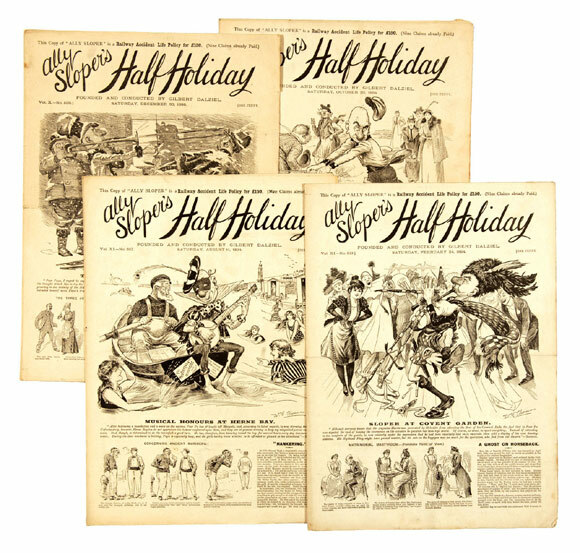 64 issues of Ally Sloper’s Half Holiday with some seasonal Christmas issues took £330 with Gilbert Dalziel’s bumbling schemer attracting strong interest 125 years down the line. 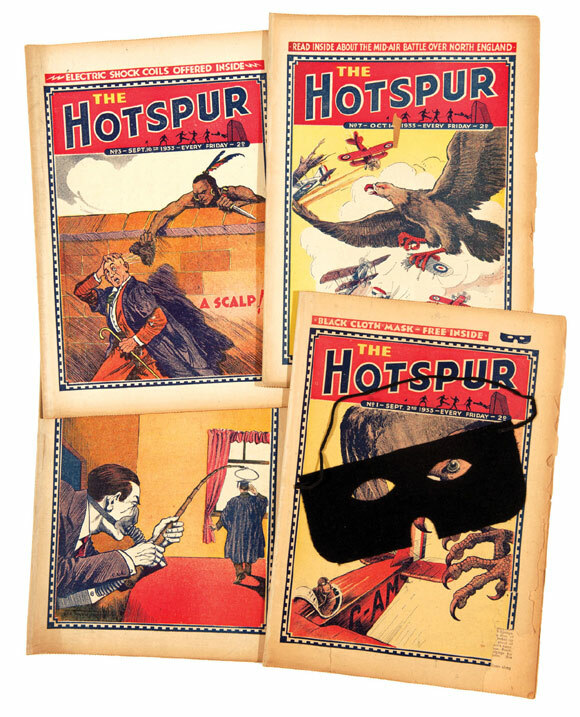 Although these early Hotspurs were low grade with page edge brittleness there was no shortage of interest, especially as the lot included the rare No 1 free gift Black Cloth Mask. 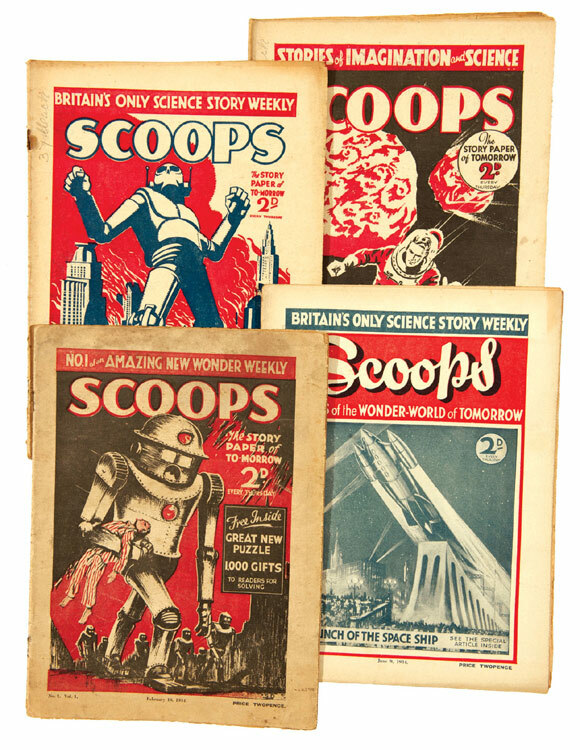 An undisguised £385 won the day..
A full run of Scoops do not appear very often and Britain’s first science-fiction weekly, some with grubby covers, secured £440; only the fourth set we have sold in twenty years. 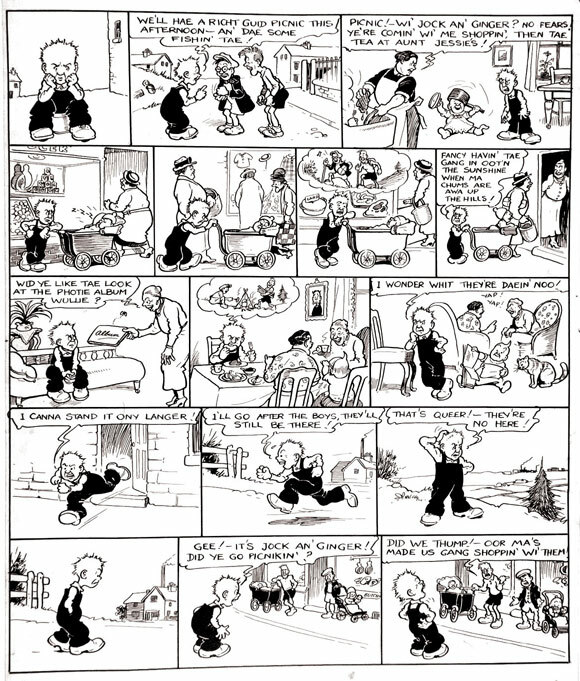 This was one of the earliest Oor Wullie artworks from the late 1930s and it featured a rare appearance of Ma’s bairn, the Wee Lad’s younger brother, who was later withdrawn from the story line, presuming that one young rascal was quite enough for Dudley Watkins to handle. £847 was duly proffered and accepted. 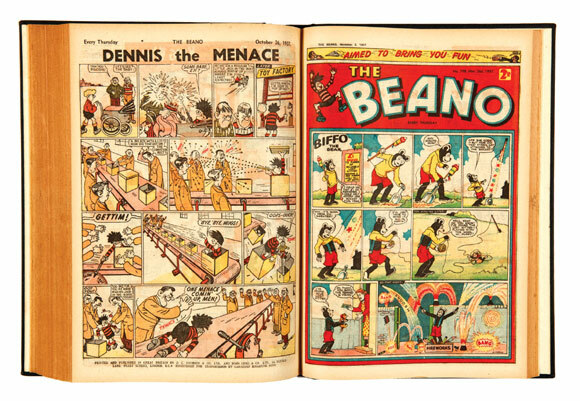 The Beano Book No 1 has come up for auction about 23 times over the past 25 years and the above example in [vg] grade made its lower estimate of £2000. It is inevitable that when iconic items like this come onto the market with some regularity the aura of scarcity can become diminished leading to lower prices. 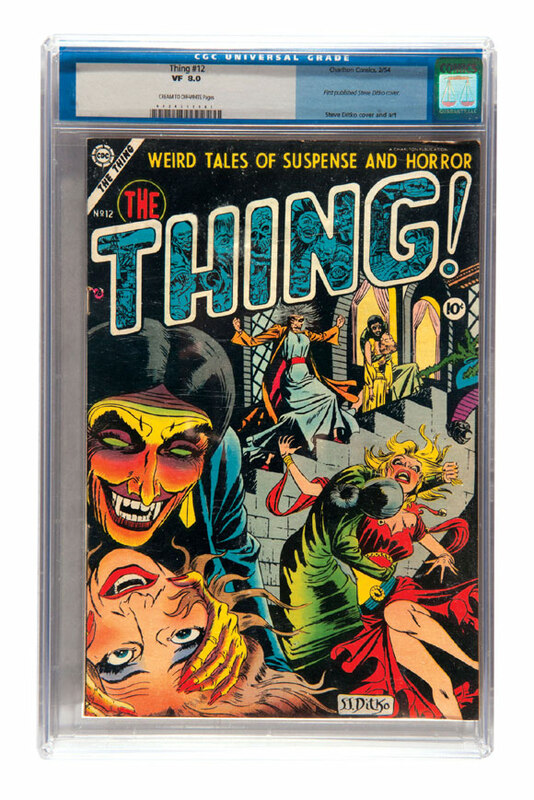 However, this only applies in the medium and low grades and if a fine or better copy was to come to auction the records might tumble again, such is the desire for high grade key editions. 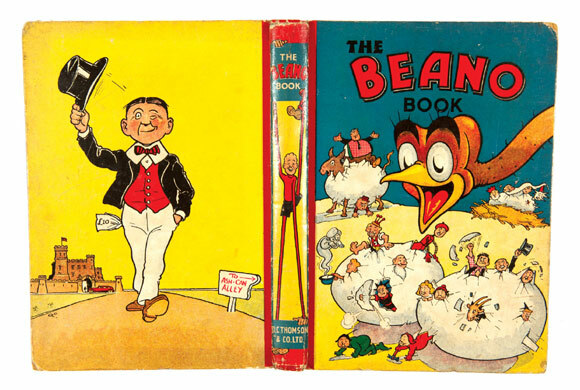 The second Beano Book is rarer than the first and 12 or so are known to exist. Prices should continue to stay strong as this [vg] copy proved with £1815. 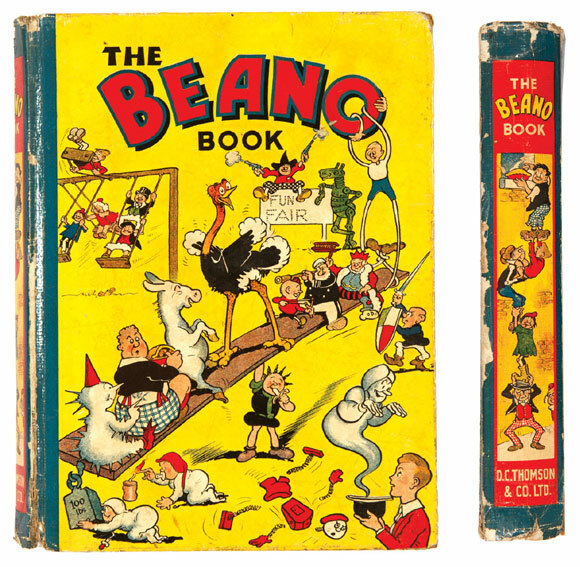 Our Beano bound volumes attract strong bidding and this complete year for 1947 created a new record with £1210. The annual that we offered for the same year continued that trend as a restored spine copy took £308. 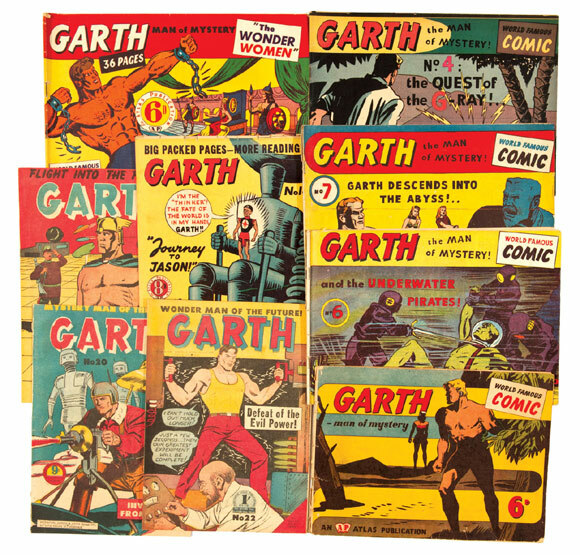 Here was the complete Australian set of Garth, all 24 testosterone filled issues, and having never been offered before this rare group strong-armed £292. At £13 each a very good buy in our opinion. 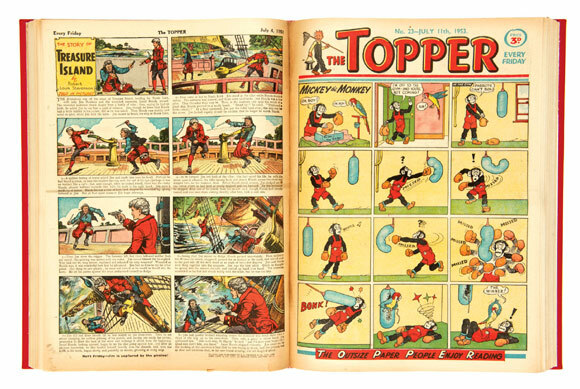 Beano bound volumes to the fore once more. This time the complete year of 1957 where the Horse That Jack Built made a record breaking run with £771. 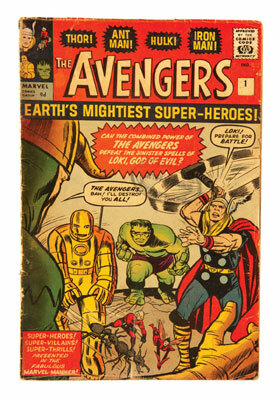 Korky’s Toy Shop cover is a favourite 1952 annual and £302 secured this [fn+] example. 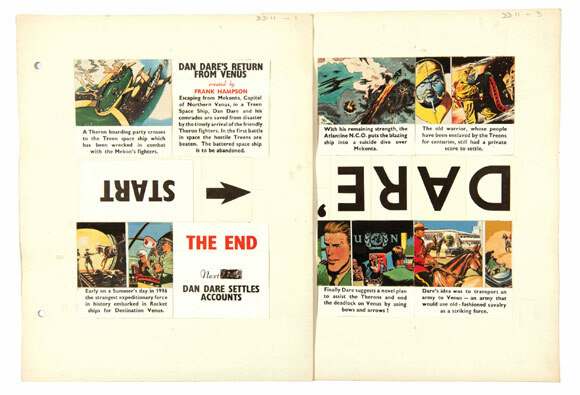 Dan Dare’s Return From Venus 9 page story boards for the Martin Lucas Mini Cine film strip was a reasonably estimated item that was originally collated by Frank Hampson with background artwork added. From various Eagle Venus story lines the artwork was arranged clockwise from top to bottom to facilitate film strip viewing. This looked complicated but it wasn’t, especially to the £440 winning bidder who clearly understood that this was a bargain basement way to corner some Hampson edited originals. 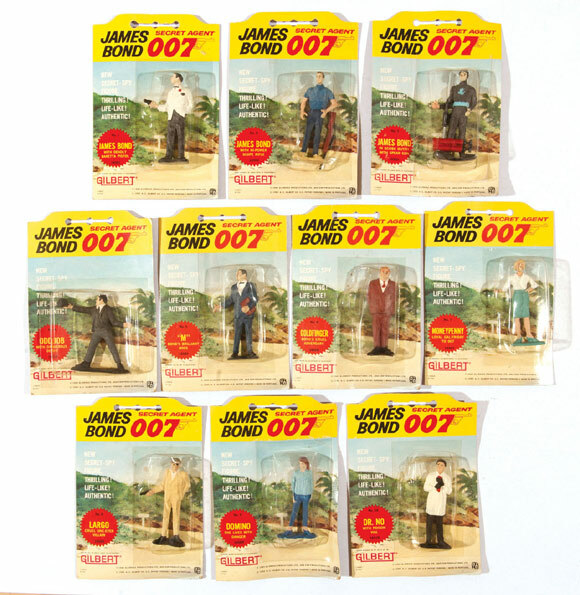 The James Bond 007 collection of 10 Secret Spy Figures was complete with blister packs intact ensuring that arch-villains Odd-Job and Doctor No could not escape the hammer. £240 led the Q. 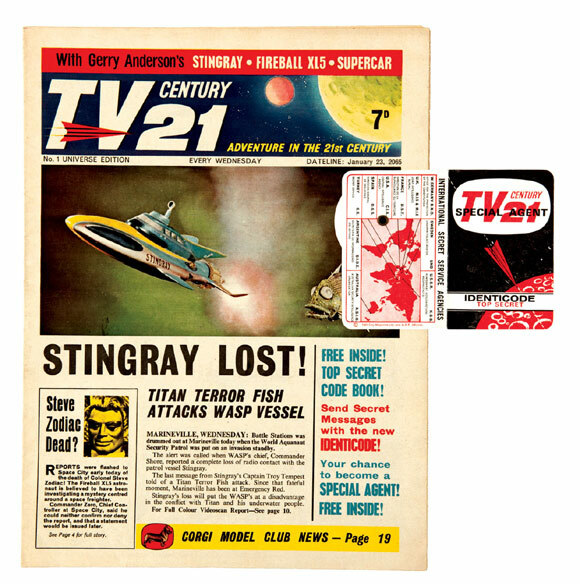 Here was a very high grade example of TV Century 21 No 1 with its all important Secret Decoder gift unused. 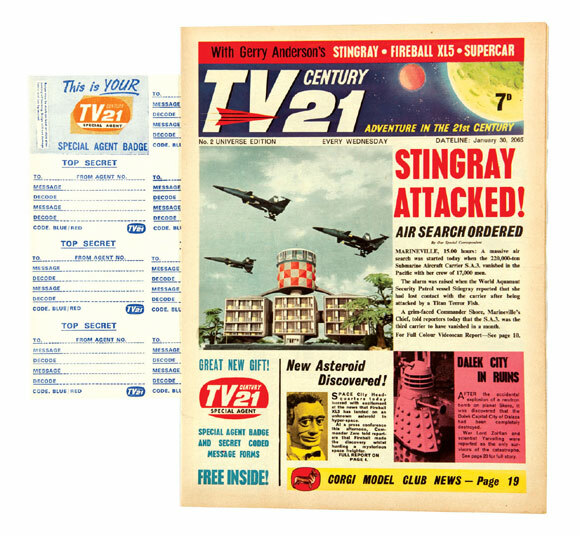 Stingray, Fireball XL5, The Daleks and Lady Penelope were seduced with £661. 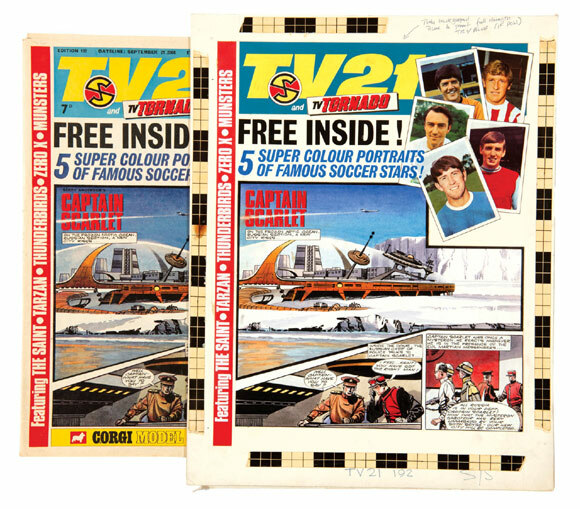 Similarly issue No 2 had its Special Agent badge and Secret Coded Message forms uncut and a very strong £331 was successfully tendered. FAB. 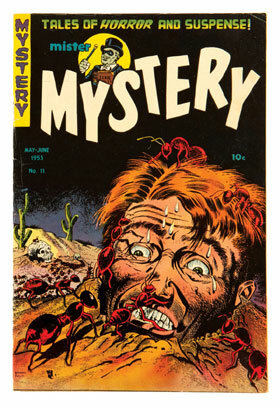 Frank Bellamy’s original cover artwork of Captain Scarlet for TV 21 No 192 was bright and fresh, not a given with the Pelikan inks that Bellamy favoured for this kind of work as they tended to fade substantially with time. 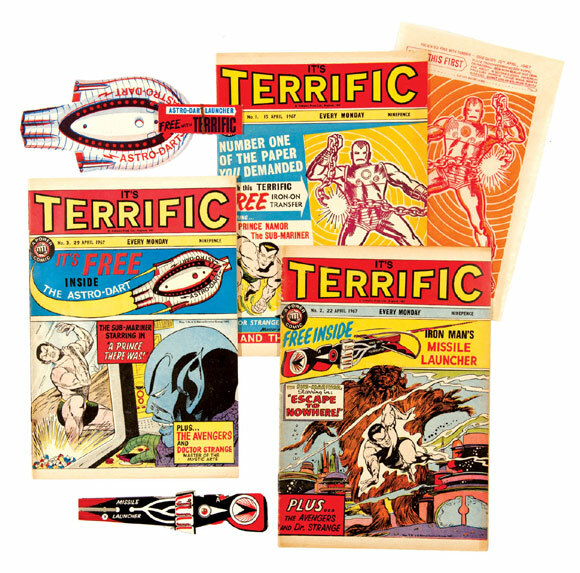 As a seasoned collector, our £715 winning bidder knows all about this and he will frame a laser colour copy for every day enjoyment whilst the original in safely stored out of the light. 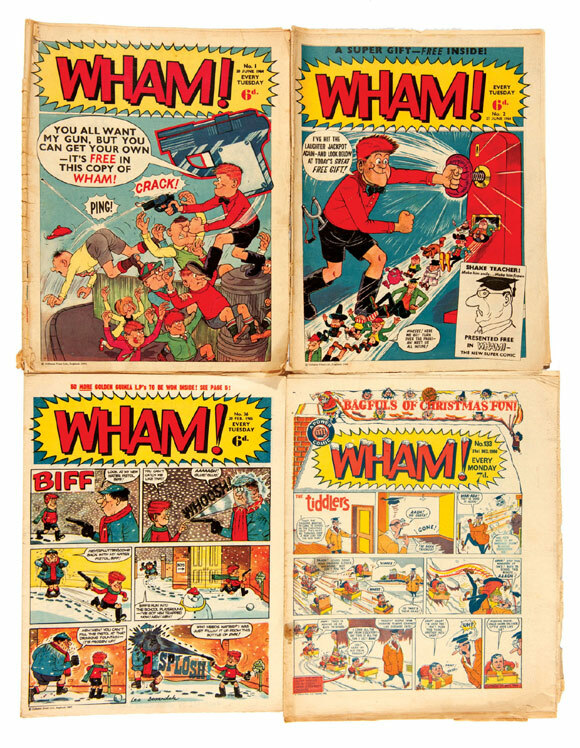 The first 47 issues of WHAM! with 37 further issues in mid to low grades made £254. 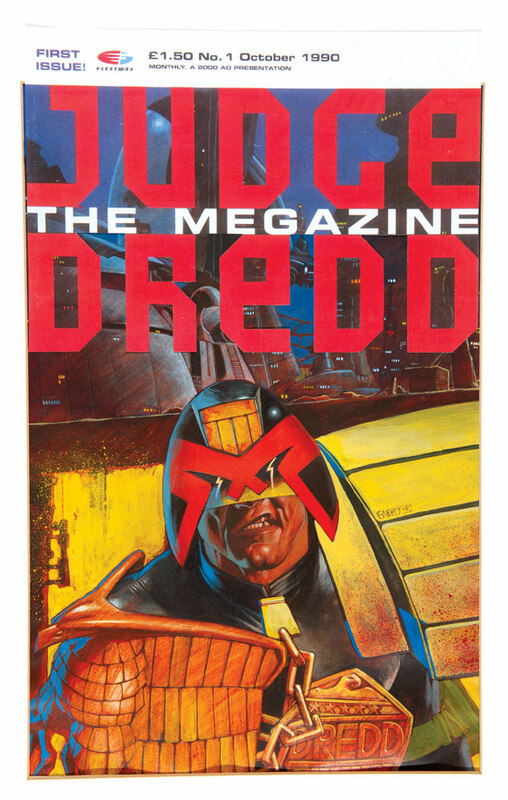 A Grimly Feendish £3 each..
Judge Dredd’s artwork is as robust as his Lawmaster motorcycle and the front cover of his first Megazine in 1990 was painted and signed by Glen Fabry, the award winning artist of Slaine, Hellblazer and Preacher. No prayers were necessary to achieve a double estimate £770. 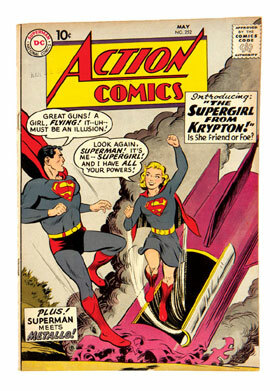 Our US section opened with Action #252, Supergirl’s first appearance in 1959 and this [fn] copy realised a whopping £605. 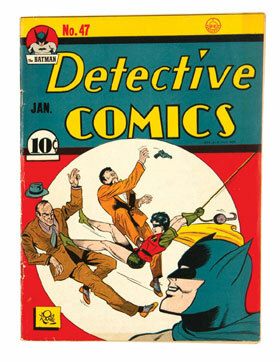 A fresh covered copy of Detective 47 from 1940 realised £495. 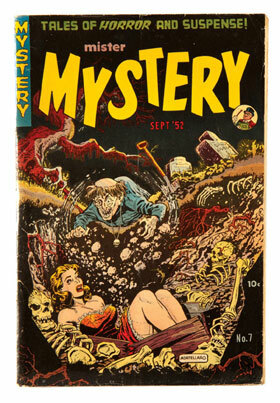 Mister Mystery is a cult title with collectors. 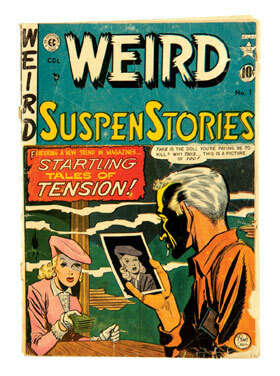 These two key issues showcased Basil Wolverton’s Brain Bats of Venus and Robot Woman. #7 in [vg+] made £247 and #11 in [fn+] reached £271. Shock, horror. 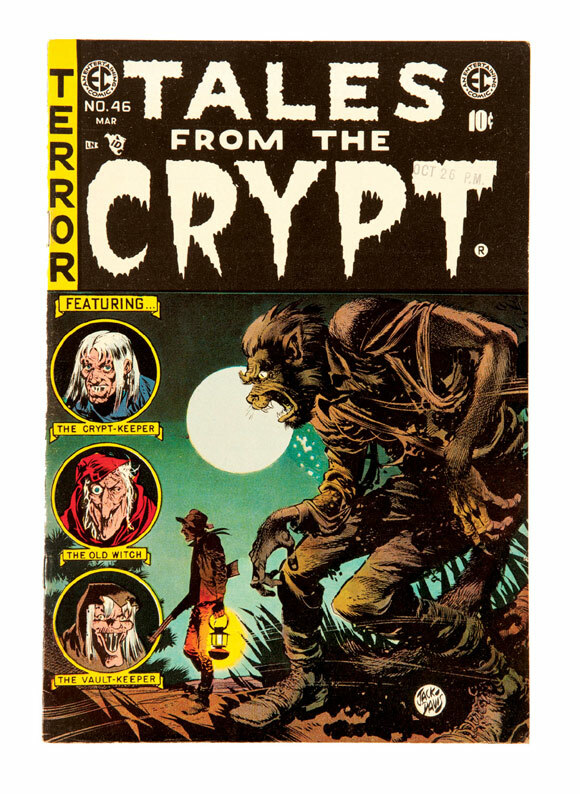 Tales From The Crypt #46 was the title’s low distribution final issue and with a perfectly acceptable date arrival stamp to the cover its Very Fine grade was not compromised. With high cover gloss and white/off white pages £440 caged the werewolf. Hopefully CGC will not confine it further. The Thing! 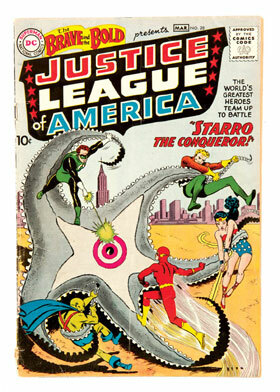 #12 holds keen interest for collectors as it highlights the first published Steve Ditko cover. This example had a CGC grade of 8.0 so £631 carried the thing off. 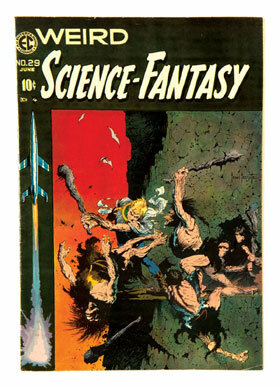 Weird Science Fantasy #29 with Frazetta classic cover art reached £337 and the rare EC Canadian copy of Weird Suspenstories #1 in low [fr-gd] grade soared to £307. .
Spider-Man’s first appearance generates massive interest in Amazing Fantasy #15 and this particular example was no different. 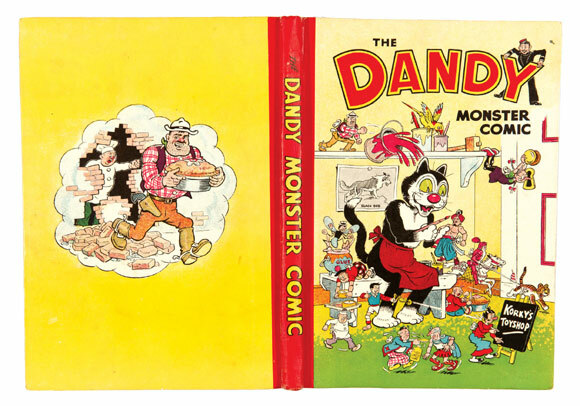 The book was a bright, fresh copy which had been professionally and sympathetically restored. With a grade of Apparent [fn-vfn] there were many serious bidders and £2,640 finally emerged victorious. Key issues are always keenly contested and here were two differing grades to compare. 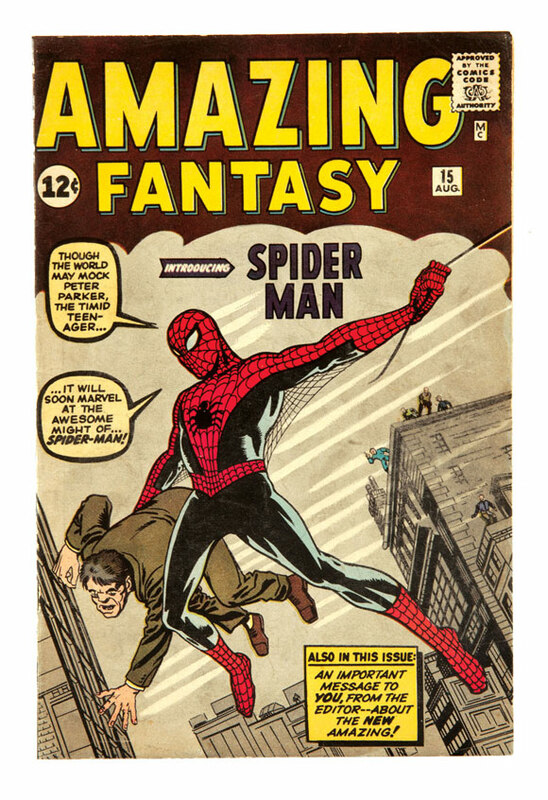 The Amazing Spider-Man #50 cents copy in [fn+] at £210 and a dull Avengers #1 pence copy with book shop cover stamp [gd+] at £330. From a purely financial point of view which would you think to be the better long term investment?. 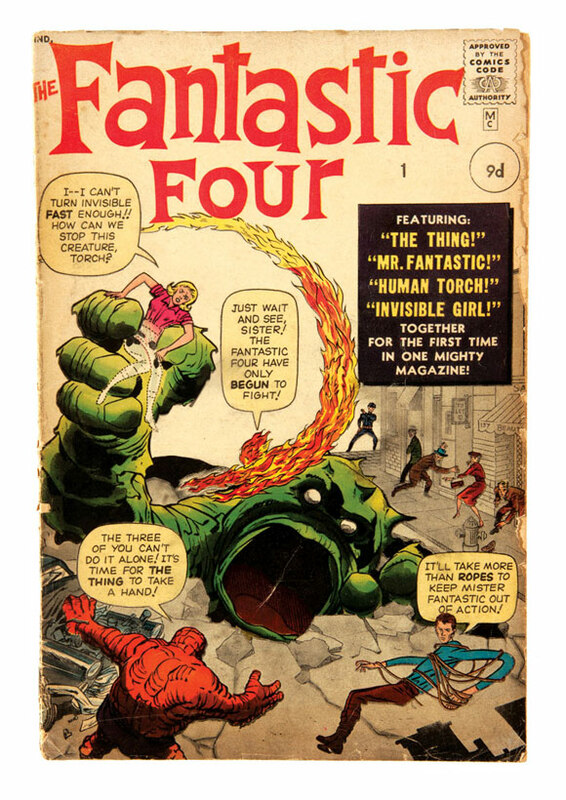 In the same vein this rather worn pence copy of Fantastic Four #1 with extensive Marvel chipping and worn spine [gd] took £825. 13 years separate these two comics, one the birth of the Justice League of America, the other the death of Gwen Stacy; both seminal moments in comics history. Brave And The Bold #28 was a [vg] copy with medium wear and since most copies that surface are generally lower grades than that £451 was a highly respectable price. 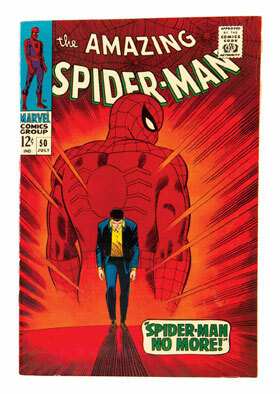 Amazing Spider-Man #121 [vfn-] was taken to a very high £291 from its £40-55 estimate with (not illustrated) #122 [vfn-] (both the same value in Overstreet) realising £62. 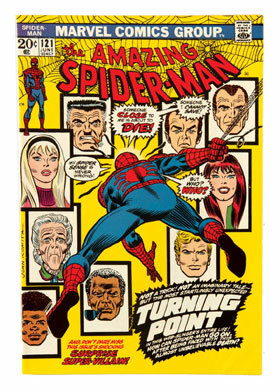 Obviously we care much less for the Green Goblin who Spidey duly despatched in this issue. 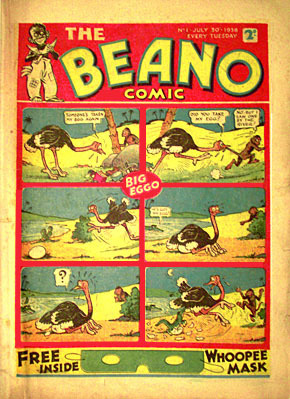 Generally I reckon we get about ten phone calls and emails a month from people who have uncovered a copy of the Beano Comic No 1 from 1938. 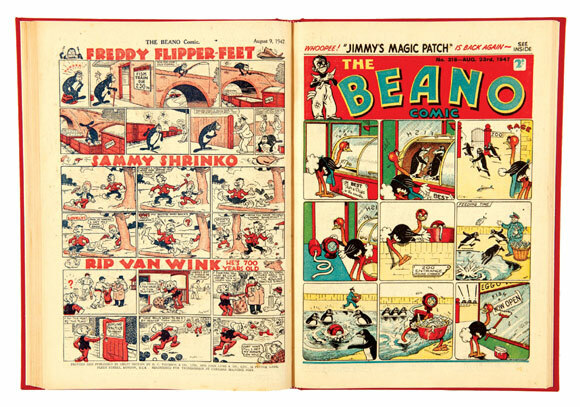 In 1976 DC Thomson licensed the publication of facsimiles of The Beano and Dandy first issues to show what the original looked like. The main difference was that the reprints have staples whereas the originals do not. We have even had people sending us artfully unfocused scans with the staples removed to convince us they have the real thing. More scams than scans, really. 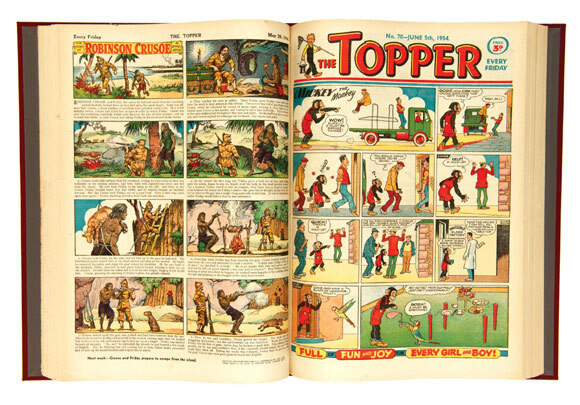 Just after this current auction closed we had just such a call where the discussion centred around a friend of a friend who had bought a large collection of postcards at a general auction which had ‘a few old comics’ at the bottom of the box. 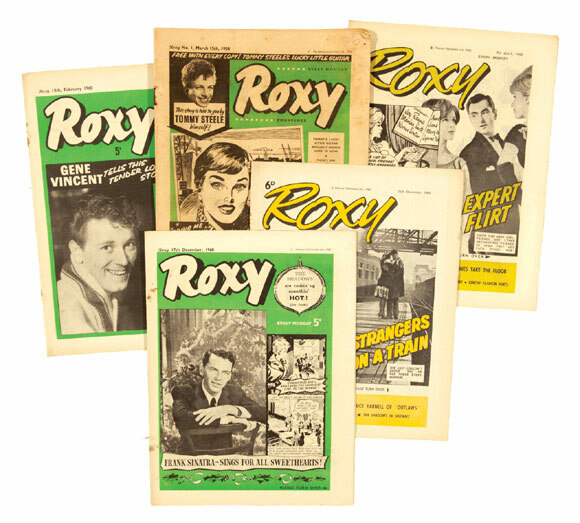 Not interested in the comics, the buyer offered them to the gentleman who was now on the phone to me telling him there were some Beanos there as well and would he like to buy them all for a few quid? So he did. By this time I was quietly stifling a yawn as we laboriously approached what I hoped was the point. He then told me that within a few weeks he had sold on the early Beanos apart from ‘a No 1’ which he decided to keep for fun and that he had received £50 or £60 each for the others. Now I was bolt upright in my seat as he suggested popping it in the post to see if it might be an original. Well, the postman delivered it the following day and, dear reader, it is an original and it will be the star attraction in our next auction in February 2014. Here’s a scan. In focus. Without staples.